Boronia is a genus of small shrubs, with approximately 95 species and all but one are native to Australia. Many species in the genus are renowned for their spectacular floral displays and unusual scent but brown boronia (Boronia megastigma) is particularly sought after for its fragrant flowers. Brown boronia is native to the south west of Western Australia. A perennial shrub growing to 1–2 metres in height, it has small aromatic leaves and in springtime, it produces flowers that have a very intense and attractive fragrance. The flowers are usually deep chocolate brown on the outside of the cupped petals, and bright yellow on the inside, however there is some variation in colour between types. While both leaves and the flowers are fragrant, only the flowers are used for production of essential oil/extract. The purified oil extract has been available on the world market since the 1920s. 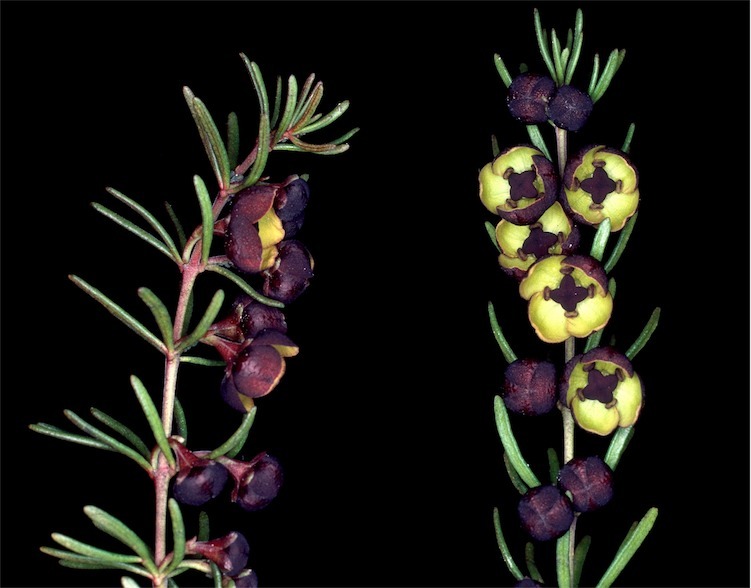 Traditionally, brown boronia was harvested from wild stands in Western Australia for cut flowers and essential oil production, however this has now stopped due to the risk of disease being spread through native plant communities. Brown boronia has been farmed since the mid-1980s, mainly in Tasmania. Boronia oil/extract is used in perfumery and as food flavouring with the major markets being United States of America and Europe. It is also used in aromatherapy. The boronia oil/extract industry is classified as a maturing industry in Australia and the interests of its growers and producers are represented by The Essential Oils Producers Association of Australia. 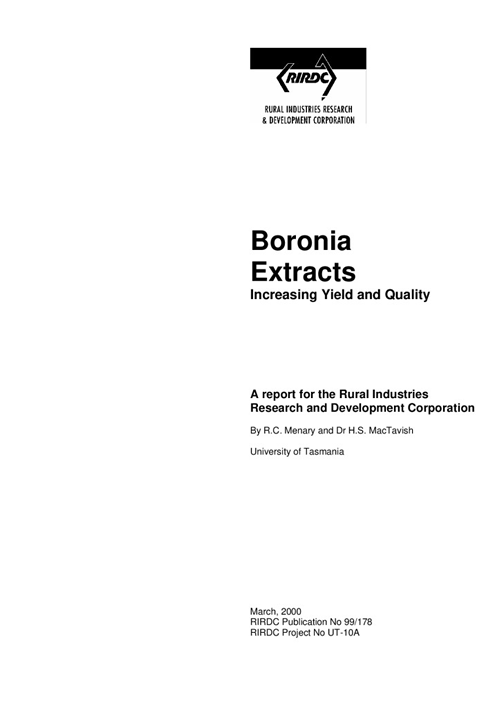 Commercial production of boronia in Australia is around 30 hectares, with most of that area made up of four separate plantations in Tasmania, the main producing state. A small amount of boronia oil/extract is also produced in Western Australia. A mature plantation produces around two tonnes of flowers per hectare, so Australian production in equated to around 60 tonnes of boronia flowers, which had a gross value of AU$780,000. Brown boronia is endemic to the south west of Western Australia, where it is commonly found as an understorey species. However, most of the commercial boronia farms in Australia are based on the north and east coasts of Tasmania. 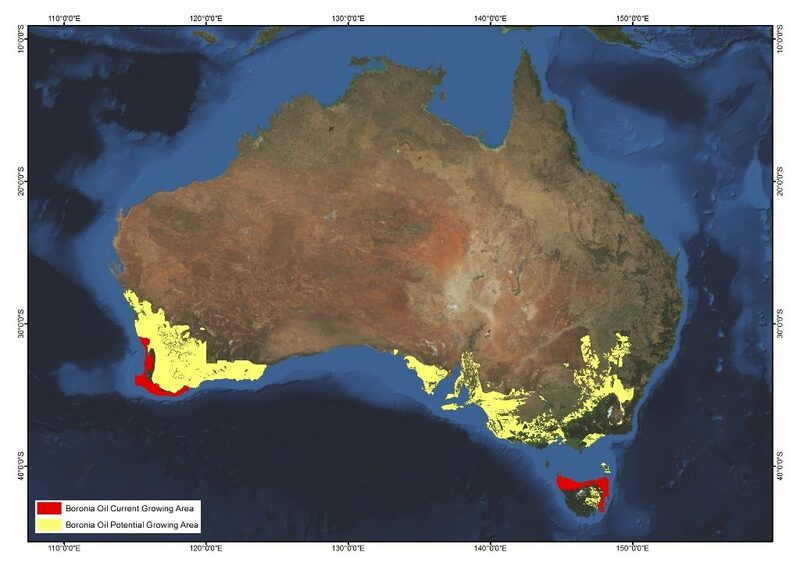 The most suitable growing regions for brown boronia have been identified as the coastal regions of the South West of Western Australia, the north, north east and east coasts of Tasmania, and southern coastal regions of Victoria. Boronia has reasonably specific soil requirements, preferring a soil pH(water) between 4.0 and 5.0, however trials have shown the plant will grow in soil with a pH of as low as 3.5 and as high as 6.5. The soil should have high organic and low clay content, with high flower production being obtained on well-drained acid sands. The natural vegetation on this preferred soil type is usually a coastal heath or bracken fern. Soil should be tested for phytophthora and nematodes and also for residual phosphorus as boronia, like many Australian natives, does not tolerate high levels of phosphorus. Boronia does not like warm moist soils and losses from root rots may occur in these conditions. The cool temperate regions of Western Australia, Victoria and Tasmania are well suited to boronia production, particularly the coastal regions of these areas. Brown boronia is reasonably hardy and can survive temperature extremes, from the dryness of a Mediterranean-type climate to the frost and snow of Tasmania. The rainfall in these suitable growing areas is generally sufficient for production, however irrigation is recommended for young seedlings and for maximum flower yield. Temperature and photoperiod requirements for boronia are quite specific. The plant will remain vegetative at temperatures higher than 25°C and any flowers that have initiated will most likely abort. 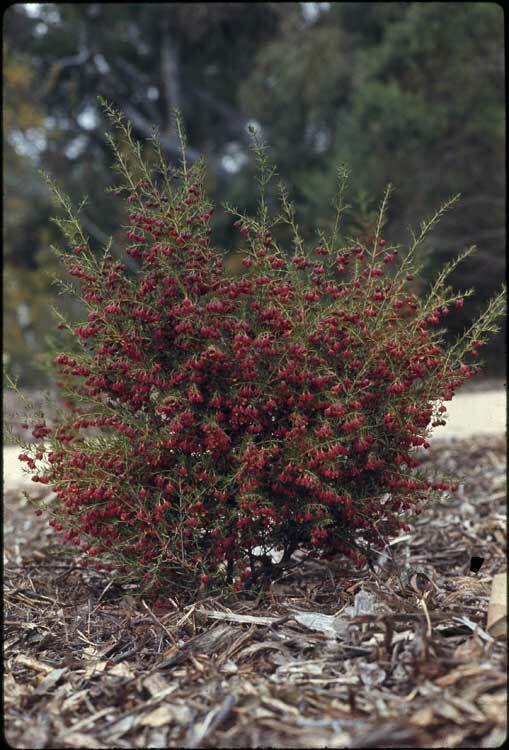 A cool period is required for boronia to initiate flowering. In autumn, the ideal weather conditions for maximum flower number are approximate night temperatures of 10°C, day temperatures of 15°C, a 10-hour day length and full to 50% sunlight. These requirements may restrict the climatic range in which boronia can be commercially produced. 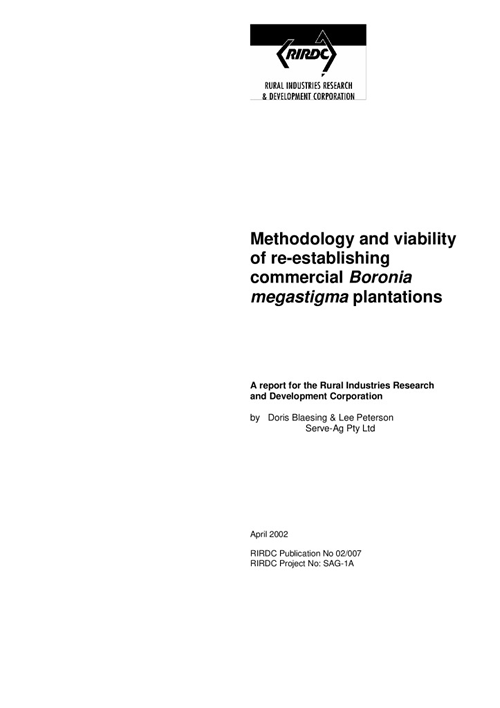 Commercial varieties for oil/extract production from Boronia megastigma have been selected for improved yield, agronomic performance and disease resistance, however these are only available through a licence agreement with the owners of the lines. Strong winds can damage boronia plants so windy sites should be avoided or windbreaks considered. Land preparation may be as little as minimum tillage and planting as the site presents itself; alternatively, the site may be cleared and levelled to remove large tree roots, which may be a source of soil-borne diseases. As boronia seed is difficult to germinate, boronia plantations are established using transplants derived from the vegetative propagation of clones from mother stock. Depending on the planting design, densities up to 19,500 plants per hectare are used in Tasmania and between 7,000 to 10,000 plants per hectare in Western Australia. Rows should be aligned north to south. 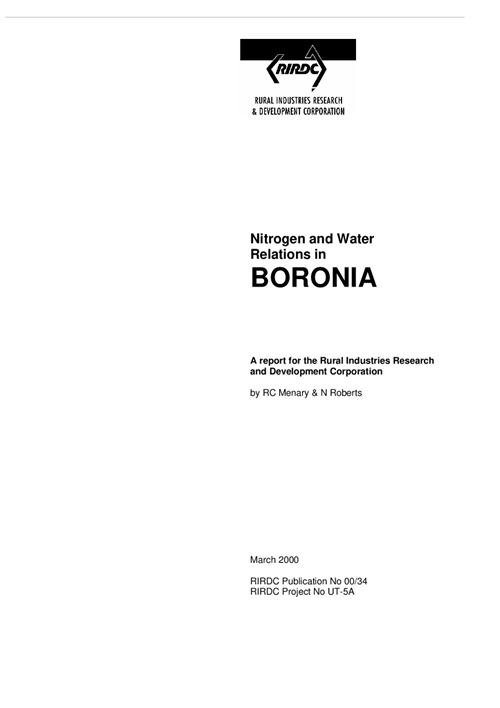 Slow release fertilisers should be applied to boronia; the fertiliser should be low in phosphorus, as boronia will not tolerate high levels of phosphorus. Irrigation is not necessary but recommended to achieve maximum yields and may aid the establishment of a crop. Caution should be exercised if growers are considering re-planting a plantation with declining production as a re-plant disorder has been identified amongst existing growers. A comprehensive management plan has been devised to address this. 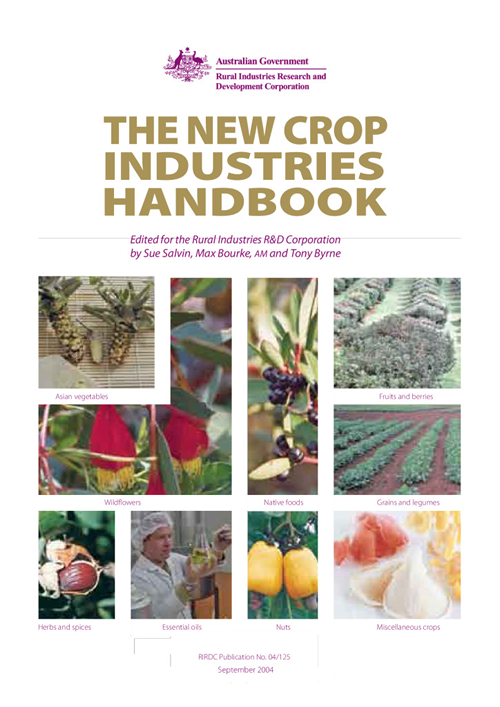 Further information on planting and crop management can be found in the New Crop Industries Handbook. A competitive plant population of boronia should reduce weeds in plantations and mulching can also provide good weed control. Particular weed problems may need to be managed, however herbicide use should be kept to a minimum to reduce any residual contamination of the boronia oil/extract. Pests of boronia include psyllids, black scale and brown scale, Rutherglen bugs, stem borers, cutworms and nematodes. Integrated pest management systems should be practised to manage these pests, such as cultivation, use of insecticides and pruning. Boronia is quite susceptible to root rot diseases such as phytophthora and armillaria. Phytophthora is a significant issue for boronia production in Western Australia. Good sanitation practices should be adopted to avoid these diseases, such as the introduction of disease-free plant stock and the sterilisation of machinery and other equipment. Boronia rust can be a significant problem in plantations but there are registered pesticides to manage the disease. Checking to ascertain that there will not be any problems with residues before spraying is important, particularly if contaminants then reside in the oil/extract. Growers should consult with an advisor or the industry association about management programs for weeds, pests and diseases. In some cases it may be necessary to obtain a minor use permit from the Australian Pesticides and Veterinary Medicines Authority (APVMA) to use pesticides not registered for boronia or the growing region. Any browsing or grazing animals, such as rabbits, bandicoots, sheep and cattle should be fenced out of a boronia plantation as they will graze on and disturb the plants. 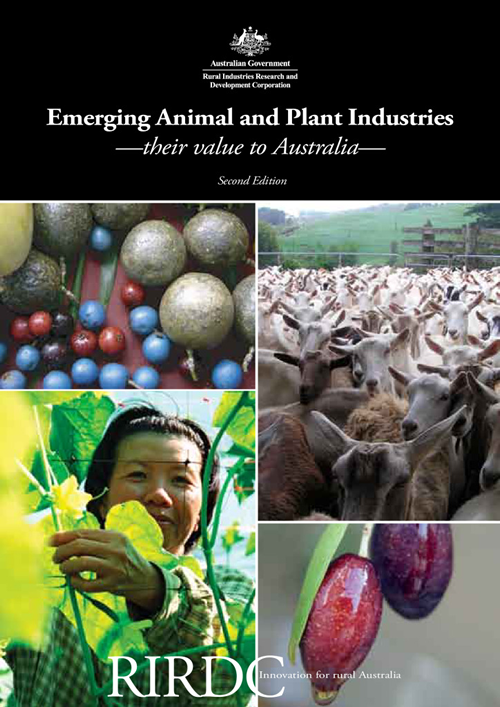 For detailed information on pest and disease management for boronia production see Growing boronia for Western Australia and more generally the New Crop Industries Handbook. The main infrastructure requirements associated with growing boronia for oil/extract production are general farm equipment to maintain the plantation area, such as a tractor (high clearance once the crop is about 3 years old), mower/slasher and pruning equipment. Mechanical aids and mechanical harvesters are available, though the purchase of this equipment will be determined by the size of the plantation and feasibility of using contract services rather than purchasing equipment. Solvent extraction equipment is required, as well as expertise and permits for operation. For entrants and small producers, it may be more practical to consider contract extraction until the enterprise is established. Many factors influence the productivity of boronia including local climate, plant genotype, fertilisers, method of irrigation and pest and disease incidence. Plants will generally flower 12–15 months after planting and may yield 8–12 stems per plant. Commercially, plants of B. megastigma can be productive for 5 to 8 years although exceptional examples lasting up to 15 years have been experienced. Boronia flowers in spring and is harvested when 80% of the buds are open. The flowers are combed off the plants by hand or machine. Prototype mechanical harvesters have been developed by several commercial producers. It should be noted that very strict requirements are placed on the level of leaf matter mixed with the flowers as the leaves contain waxes, which alter the composition of the oil extracted. Once the heat has been removed from the harvested flowers by refrigeration, the flowers can be stored at -18°C for a period of time before the oil is extracted. The oil is extracted from the flower petals using liquid carbon dioxide or a hydrocarbon solvent such as hexane. The initial crude extract is then further refined into either a waxy solid called ‘concrete’, or a liquid called ‘absolute’. This extraction process is more complicated than the steam distillation process used for other essential oils such as fennel and parsley. The spent plant material that is produced as a by-product of this process can be used on farm as mulch or potentially in the garden industry. After harvest, the plants are usually heavily pruned, to a height of 25–35 cm, to stimulate more flower production. The majority of boronia oil/extract produced in Australia is produced under contract to one major company. Most of the Australian production of boronia concrete and absolute is exported, mainly to Europe and the United States. In recent years, the industry in Tasmania has been evening out supply of export product through releases from its stockholdings, suggesting that supply may in fact exceed the contracts secured in Australia. Boronia can be quite difficult to produce, it is prone to root diseases and rust can decimate a plantation. 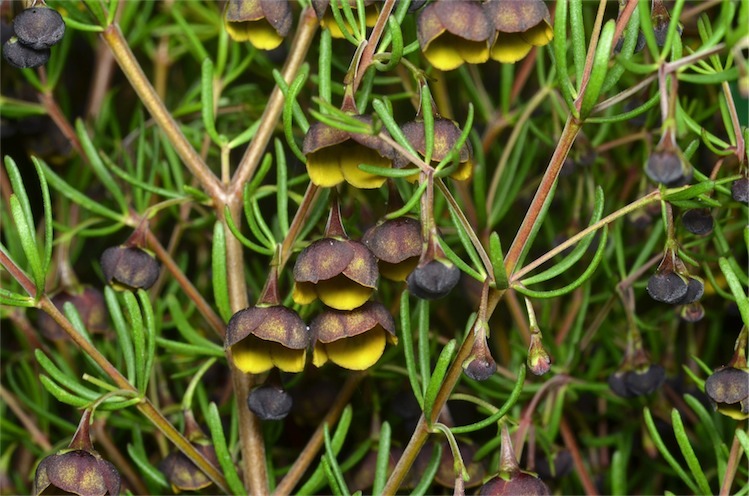 The extraction method for boronia flowers is more complicated than for other essential oil crops and expert advice should be sought before establishing an extraction facility. Alternatively a contract extraction arrangement could be found to process harvested product. The markets for boronia oil/extract are highly specialised and growers are recommended to seek contracts before considering producing the crop. Establishment of an extraction plant requires the appropriate permits from the local government in the shire or region where the building application is being sought. Operating an extraction system based on solvent extraction requires expertise and the appropriate permits. There is no formal standard for either boronia concrete or boronia absolute. If the boronia oil/extract is to be traded into the European Union it must be compliant with the European Union REACH Regulations. REACH (Registration, Evaluation, Authorisation and Restriction of Chemicals) addresses the production and use of chemical substances, and their potential impacts on both human health and the environment. This legislation impacts on all of the trade, both domestically and to those companies worldwide, supplying flavours and fragrances to the European Union. For therapeutic use, any products containing boronia oil/extract have to be listed on the Australian Register of Therapeutic Goods. This organisation also covers the required packaging for therapeutic products. Details of regulatory issues for essential oils in Australia are overseen by the industry association – the Essential Oils Producers Association of Australia.